The ancient practice of eyebrow threading has been culturally significant in the Middle East and India for thousands of years. In recent years, threading for hair removal has emerged as a preeminent cosmetic service in America. Eyebrow threading presents several advantages (listed below) over alternatives like waxing and plucking. 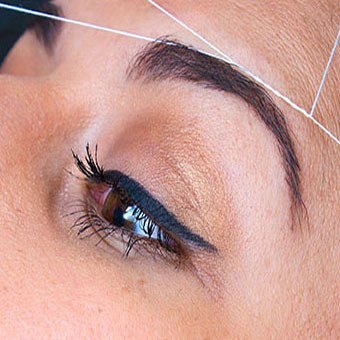 By its nature, eyebrow threading is a more accurate technique than plucking or waxing. In threading, straight lines of hair are cleanly removed at the follicle level, allowing threading artists to perfectly shape their clients’ eyebrows. Threading also provides a clearer line of vision than waxing does. With professional eyebrow threading, skin irritation and redness are usually avoided. Eyebrow waxing can pull at the skin, causing pain and possibly premature wrinkles. Threading cleanly eliminates hair at the follicle level with minimal pain or redness. Furthermore, threading doesn’t include the use of chemicals which can be harmful to people with sensitive skin. Eyebrow threading is considerably cheaper than waxing. High quality eyebrow threading can cost as little as $12, while professional salon waxing is often more than $25. Threading is also much faster than plucking hairs out one by one. While anyone can be trained to wax eyebrows, professional threading artists are often supremely talented with roots in the ancient tradition. It takes years of experience to master eyebrow threading; so when choosing a reputable threading salon, you know you’ll be getting elite service. Click here to learn more about eyebrow threading and to schedule an appointment today.